Captain Rohit Sharma's bat is raining heavily in the second ODI of three match series at Mohali against Sri Lanka. Rohit Sharma has completed his double century in this match by playing one of the finest shots. Rohit ended his inning with unbeaten 208 runs and took 153 balls to achieve this feat. Interestingly, it is the second marriage anniversary of Rohit and Ritika Sajdeh and to calebrate Rohit's batting his wife was spotted chearing in the stands and on this special occasion, even though he is unable to spend time with his wife, but his wife Ritika is definitely with him to encourage him on the field as well as off the field. Rohit Sharma hit a big shot in the match being played on the anniversary, which made his wife happy. On the fifth over, Sharma hit the boundary, after which the camera was focused on his wife sitting in the stadium. After seeing this spectacular shot of Rohit Sharma, his wife looked very happy, his reaction was very good. Team India lost 4 wickets in 392 runs and set Sri Lanka a target of 393 runs. On behalf of Team India, Captain Rohit Sharma has made his world record by scoring his third double century of ODI career. He has become the first batsman in the world to score three double centuries in ODIs. 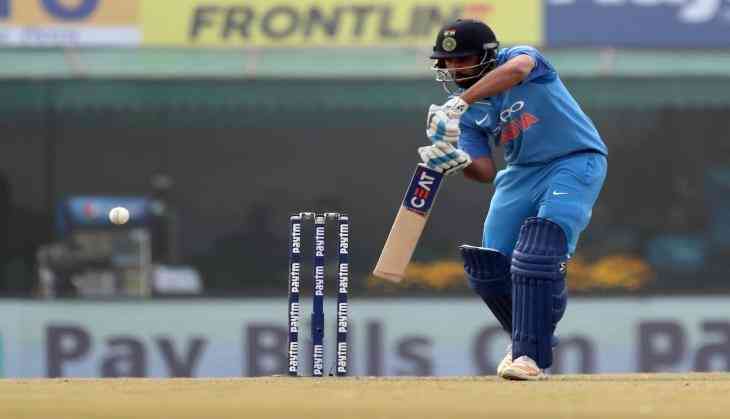 Rohit Sharma has made a world record before (year 2013) 209 against Australia, (year 2014) 264 against Sri Lanka and today once again 208 runs against Sri Lanka.